I love a good chicken salad. Especially when it’s well balanced. A little of this, a little of that, and you have a complete meal. Case in point: This Clean Eating Tangerine Walnut Chicken Salad. Delish! In this case, you have chicken (protein), fruits (carbs) and nuts (fats). Serve this over a bed of lettuce or raw spinach and you truly have a complete meal! And while I know it seems like this would be a very sweet salad with all the fruit, it’s actually only mildly sweet in flavor. It’s a quick and easy salad to throw together for lunch too. Just don’t keep it in the fridge for more than two days. The fruit starts to break down and it’s not very tasty after that, which is why I made this so that it would only yield three servings. And if you think deseeding a pomegranate is a pain in the you-know-what, check out this video for how to do it quickly and easily. 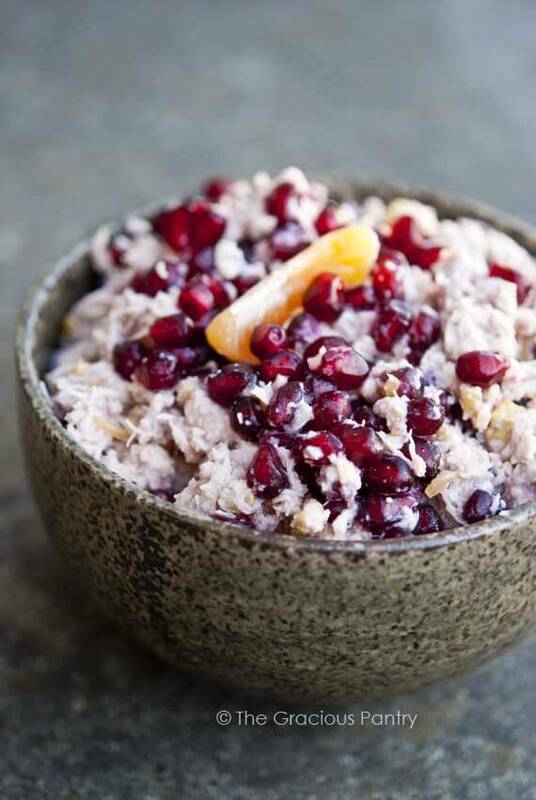 CLICK PLAY TO SEE HOW TO DESEED A POMEGRANATE QUICKLY AND EASILY! Have leftover chicken? Here's an easy and delicious salad to help you make use of your leftovers! Combine all ingredients in a medium mixing bowl and toss well to combine. Note: To save time on shredding my chicken, I simply put it through my food processor. Worked like a dream! This chicken salad looks so good! 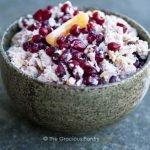 I never thought of adding pomegranate seeds to chicken salad, however this is a fabulous idea! Why so much fat? Didn’t see any fatty culprits and I would assume the chicken is boneless skinless breast? Nikole – It’s the walnuts.